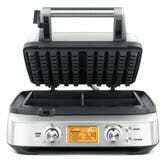 The Smart Waffle Pro brings Breville’s beautiful design and intuitive yet detailed settings to the best of breakfast foods. Whether you set the controls to classic, Belgian, buttermilk, or even chocolate, the results are perfect every time, and customizable if you want to get more nuanced. The waffle surface is ridiculously nonstick, so much so that you can clean it with just a damp cloth, and there’s even a moat to catch any runoff. I’ve been making waffles crispy enough to be finger food on the Pro without issue since July 2016. 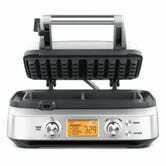 That’s a good thing, because at $250 for the 4-slice model, the Smart Waffle Pro is (probably) the most expensive waffle maker on the market, at more than five times the price of your favorite models.